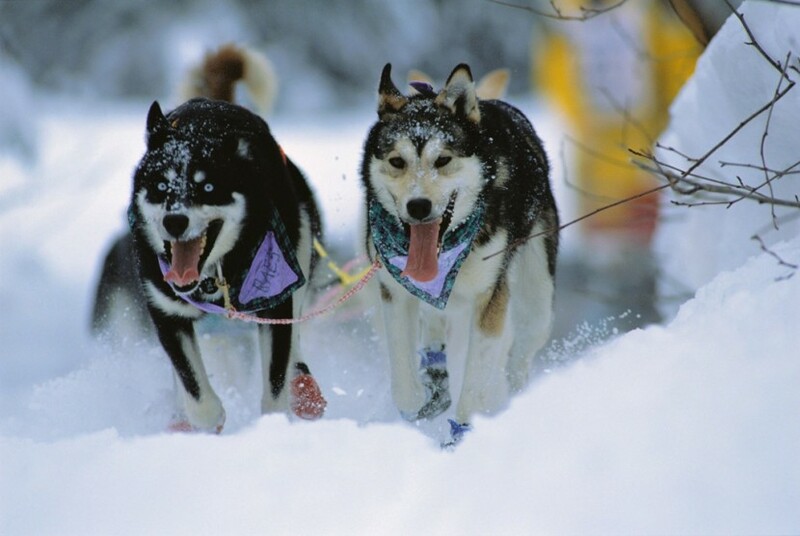 The Yukon Quest International Sled Dog Race covers 1,000 miles of diverse challenging terrain between Fairbanks, Alaska and Whitehorse, Yukon as it follows the historic Gold Rush and mail delivery sled dog trails from the turn of the 20th century. The epic Yukon Quest has run annually, regardless of the unexpected weather or trail conditions that come along with its location in the often harsh Great North, since 1984 and is celebrating its 30th running next month. In 1983, legendary Fairbanks dog mushers Roger Williams, Leroy Shank, Ron Rossler and William “Willy” Lipps, gathered at a table in the Golden Heart City’s Bulls Eye Saloon and tossed around the idea of creating a new sled dog race. The group discussed a number of concepts but settled on creating a challenging international race and naming it the Yukon Quest to commemorate the Yukon River that historically served as the highway of the north throughout the Gold Rush days. During the inaugural race that took place in February of 1984, 26 mushing teams left Fairbanks for the 1,000-mile trail across the frozen tundra to Whitehorse, testing race logistics as well as the aptitude of all the brave athletes participating. Over the next 16 days the course proved to be more than challenging, forcing six teams to forfeit the race before reaching the finish line. However, the great Sonny Lindner endured the grueling elements and in just 12 days was crowned the first Yukon Quest champion. Since then, renowned Alaska mushers like Jeff King and Lance Mackey have joined the ranks of Quest champions named in the Yukon Quest Hall of Fame. This year the race celebrates its 30th anniversary, and there are currently 26 teams – a mix of veterans and rookies – that have registered to compete in the ultimate trek across the Last Frontier. In honor of the Yukon Quest’s anniversary, this year’s race is dedicated to musher history: the fur trappers, gold miners and mushers of the north who used dog sleds as their livelihood, and inspired the creation of the Quest. The Quest kicked off pre-race festivities in November, but there is plenty more fun to be had. In Whitehorse in Jan. 30, a “Meet the Mushers” bash will take place, followed by the “Start and Draw Banquet” on Jan. 31. In addition to meeting their competitors at these events, mushers will learn their starting position and can begin to strategize race plans to get into the top 15 for the shared-cash purse prize. This year, to add to the celebratory nature of this anniversary race, the Yukon government kicked in an additional $50,000 to the $150,000 prize the Yukon Department of Tourism and Culture has historically provided. “The Quest has helped promote the territory as a destination rich with community spirit, strength of character and northern pride,” said Minister Mike Nixon of the Yukon’s Department of Tourism and Culture in an October 2012 article in the Whitehorse Daily Star. The Quest’s race direction alternates every year between Fairbanks and Whitehorse. In 2013 the race will begin in Whitehorse on Feb. 2, and will end in Fairbanks. Book your room now at the Fairbanks Princess Riverside Lodge, to participate in race celebrations as the teams roll into town, expected to happen in mid-February. For more information about the Yukon Quest and the mushers participating in this year’s race visit www.yukonquest.com.